Ever feel conflicted at the pump when you need to choose between premium gas and standard grade? Consumers as a whole have been led to believe that items with the "premium" name tag are worth the money — and can even save us money long-term. However, this is not true when it comes to premium gas. A recent AAA report found that the higher cost of premium gas offers little to no benefit for vehicles that are recommended, but not required, to use the fuel. The same goes for cars that do not recommend nor require the higher octane gasoline. According to the report, over 1.5 million new cars sold last year came with the recommendation to use higher octane gas, but it was not required for car functionality. So, unless your car requires the premium stuff, you're better off skipping it. Here are other ways drivers are wasting money at the pump. Many times, drivers will pay more for gas due to poor planning. You are desperate to find the closest gas station before you run on empty, and you don't care if you have to pay more. If this describes you, stop living this way. Not only are you slowly draining your budget, but you put yourself at risk if an emergency were to happen. Once your tank hits the halfway mark, use an app like GasBuddy to find the cheapest gas in your area. Plan to stop when you are near that station for another errand. When you find a good deal on gas, fill up the tank. 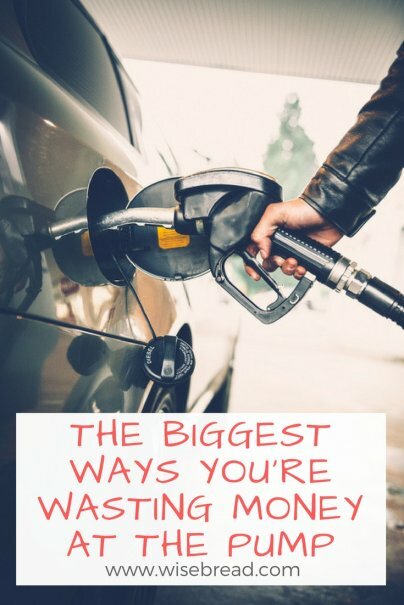 There are really only two options that are beneficial to your finances when it comes to paying for gas. The first option is to pay with cash. Some gas stations will offer a small discount per gallon if you pay with cash over plastic. The other option is to purchase gas with a credit card that offers rewards or cash back for gas. Make sure you're able to pay your credit card bill in full each month to truly benefit from the rewards. Using your debit card at the pump doesn't benefit your bank account, and it can also put you at risk. Skimmers and card fraud are increasingly common at gas stations. If you pay with a credit card, it is easier to stop fraudulent charges, and your personal bank account will not be in limbo as the bank sorts out the mess. Several small factors can add up to wasted money at the gas pump. For example, poorly inflated tires and dirty air filters can make your vehicle work harder than it needs to. This translates to more gas wasted on the road. Similarly, the heavier your car is, the more gas you will burn. Having a little extra junk in the trunk isn't going to throw off your gas budget, but if you regularly keep heavy equipment or tools in the back of your vehicle, consider lightening the load on days you don't need the items. It seems like common knowledge that a steady driving speed is better for your gas tank than overly accelerating or braking your car. However, each time I drive into Los Angeles, I am amazed by how many drivers accelerate for extended periods of time, brake hard for no reason, or drive over 90 MPH. Driving at a slower, steadier pace will extend your time between gas fuel ups and keep you away from pricey speeding tickets. For longer commutes, plan your trip so you can avoid heavy times of traffic. Using these tips can save you as much as $10 to $20 per fuel up, which adds up quickly. Wouldn't you rather spend that money on something fun than at the pump?